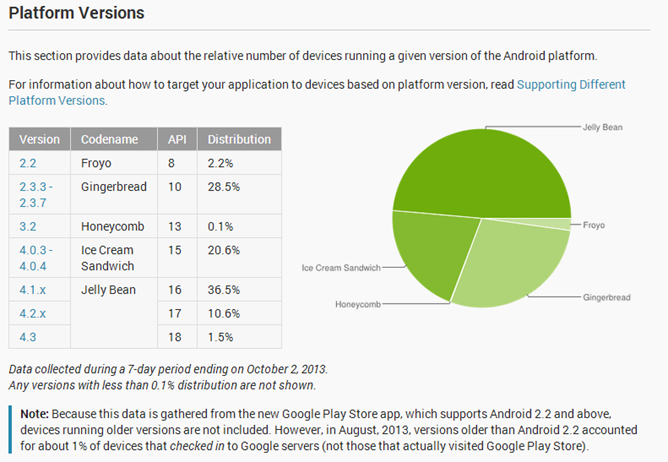 The latest Android platform distribution numbers are in, and they tell a story you probably would expect. There's no surprise ending here - more users are getting their hands on Jelly Bean, whether through updates or by purchasing new devices, and older versions are continuing their descent. Gingerbread remains stubborn, with more devices than Froyo, Honeycomb, and Ice Cream Sandwich combined. Honeycomb hasn't disappeared yet, with .1% of users still holding on to their aging tablets. 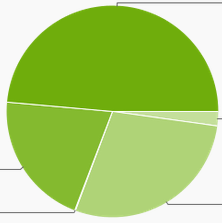 The proportion of people using Android 4.1 has remained constant - 36.6% last month and 36.5% now - but newer versions of Jelly Bean have picked up new users. 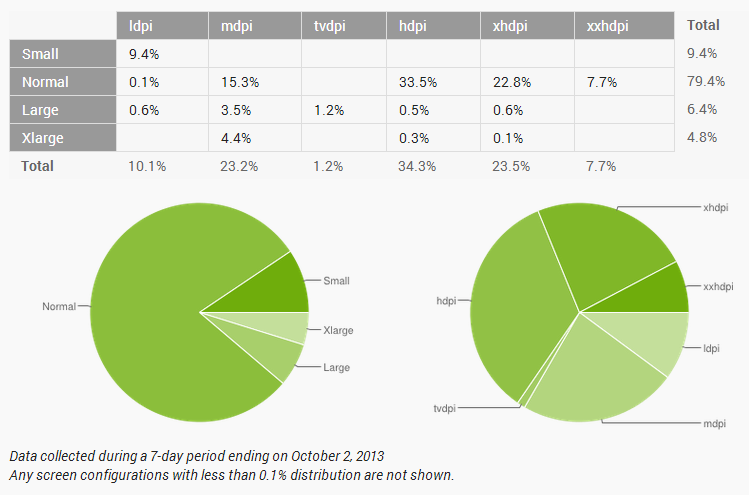 Android 4.2 has jumped up 2%, and 4.3 has made the list for the first time with 1.5%. This is likely a result of the number of Samsung devices that have entered the market in the past month, and we can only expect this number to rise further now that the Galaxy Note 3 is rolling out stateside. The screen size and density chart has remained largely stable, with roughly 80% of Android devices falling into the "normal" range for screen size (around 3 - 4 inches). Large devices (between 4 and 7 inches) have ticked up a couple of percentage points, with 6.4%, while 7 - 10 inch devices have nudged slightly upwards to 4.8%.